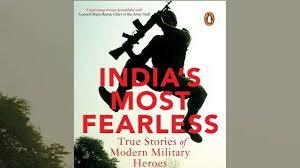 India’s Most Fearless is a book that has been long overdue – a book dealing with the stories of some of India’s decorated Armed Forces Personnel. We are a nation that for some reason lacks the literary habit of documenting the exploits of the heroes who defend our borders and our people; not only that, we lack a habit of covering the stories of these heroes, these brave soldiers once the immediate relevancy of the situation fades, and the passage of time brings fresh memories to the fore. Therefore, it is great to see a rising tendency of documenting these heroes; the current book is the second book in that genre, with the first being The Brave -Paramvir Chakra Stories, the story of our Paramvir Chakra vijetas. The other great part of this book is the equal prominence it gives to the three arms of the Forces : The Army, The Air Force, and The Navy. It is this which makes this book a must read, and not just for aficionados, civilians, but also for just about every Indian citizen who can read. For what is perhaps the first time, we get to read of the doings of our Naval Forces and our Air Force. As a matter of fact, having read a news article on the IAF during Kargil as well as Gen Malik’s book on the war, there is a need to bring out the IAF side of the story and their contributions, if feasible under law. The authors, or their advisors, or the forces, or whomsoever it was that gave this idea- perhaps all of the above – deserve a standing ovation from all for this. The Air and Naval wings get the much-needed coverage, which brings out a full picture of the extent, scope and range of heroism on display; it also serves to put the required depth and understanding of the word “Bravery”, as well as take us into at least some of the nuances of these wings of our Armed Forces. How do you review a book that is centered on true stories of bravery, courage, sacrifice of the people we have entrusted with protecting us? You certainly cant analyse the content, not beyond a point; civilians don’t have the depth perception and understanding, domain expertise to pass judgement. In that light, I make no comment whatsoever on the content – I am not qualified. The question this review tries to answer is why should a reader read this book, what value it adds, and what extra does it possess? What is it that makes this different? I have raised one such point above. The next point in this book is the coverage of the Air and Naval wings helps us appreciate the nature and context of these wings, a subject which we aren’t too aware of for various reasons. The difficulties of mounting operations in these wings, and the hardships and challenges they face in the conduct of their activities, the level of mental acuity, quick response and agility required, and the aspect of physical toughness required for even a sailer or a pilot is brought out well enough in these stories. You are left in admiration at all these qualities displayed by each officer in question in the stories, and how they saved the situation under the most trying of circumstances – Yemen evacuation, or be it near-crashes. Coming to the Army, what can I say – when I am reading the true and full story of a couple of events that are still fresh in memory- the two Surgical Strikes in Myanmar and Pakistan in the past 2 years? Here you will find their stories; but there is more. Oh, much, much more : and it isn’t all about war and fighting. As we saw above, here too, we see stories that help us understand what makes a soldier a soldier, and that it isn’t war alone that carries risks or requires toughness. This is the book that will drive home the hard point that our Armed Forces are required to be tough every day, every night, 24*7*365. Try doing that on your job, any job. Is this true? Being an Army Colonel’s Son, I know that for a fact. If you believe toughness and hardship is only in battle, read this book. But above all of this; above the stories, above the courage – which by the way is of a mind-numbing variety; you will scarcely be able to believe what these heroes pulled off – rises the Armed Forces Family and their strength. Again, knowing my mom, I know this to be true. The stories of the families, their courage, their fortitude bring a tear to the eyes. You are left with no doubt in your mind that the real strength of these brave men comes from their families. A quiet and silent thanks is due to every single Army Air Force and Naval family… this book is a tribute to them, and my personal thanks to the author Shiv Aroor and Rahul Singh for bringing this out in this tour-de-force. Even in their deaths, these heroes end up teaching us something. In their courage, those who survived teach us something. The families teach us something. And I don’t mean patriotism, Jingoism or whatever. Being tough is essential – but each and every single one of these stunning stories is a tribute to the capability of the human mind, human spirit and what it can achieve if it can be trained to keep its cool, keep calm, as that brings out the toughest responses to any situation. Reading this book is like an adrenaline shot, as it teaches you the merit of calmness and reasoned response!